Shannon Dufault, a member of Spartans' color guard from 1997-2006, sent this picture. This picture is of a few Spartans and East Coast Jazz members before going out to retreat this past summer at the DCI World Championships. 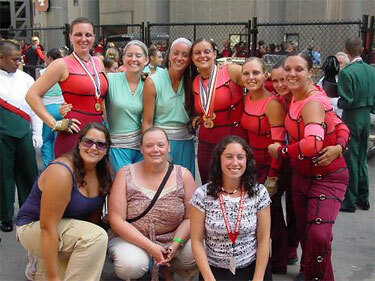 We all marched during the winter guard season together with Sacred Heart from Roslindale, Mass. Also, two of the staff members were former marching members of these corps.